The Stanford researchers adopt intergenerational elasticity (IGE) as their preferred measure. This captures the extent to which parental income influences their child’s income as an adult. (It also incorporates changes in overall income inequality, as we’ve discussed before). Estimates of the IGE typically hover around 0.4 (i.e. 40 percent of parental income differences showing up in children’s adult income). But the new study estimates an average IGE at 0.52 for men and 0.47 for women (on average across levels of parental income). These are important findings, given that the Stanford researchers’ methodology and data are stronger than in most of the earlier studies. These suffered from a combination of limited data, lack of representation of both high and low-income brackets, or attenuation and lifecycle bias. (Attenuation bias is related to the variability of parental income from year to year; lifecycle bias occurs when income metrics are taken to early or late a stage in life to be representative.) But using tax returns and other administrative data, Grusky and his colleagues were able to analyze a large dataset spanning several years. There are clear differences, however, in the degree of income persistence at different points of the distribution. Approximately two-thirds of the parental income difference between children born to an upper-income family (85th-95th percentile) and a middle-class family (45th-55th percentile) shows up in those children’s adult incomes. By contrast, about half of parental income differences between children born to middle-class and poor (5th-15th percentile) families are preserved. Substantial gender differences exist, too. 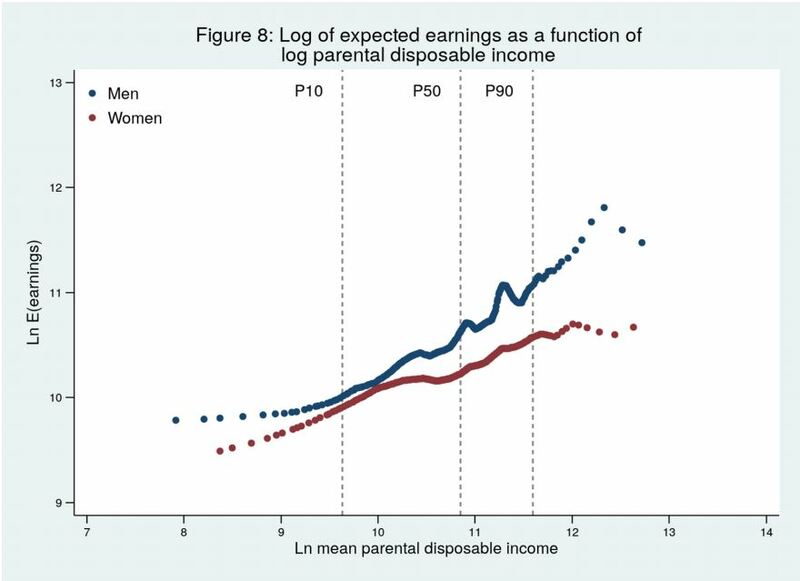 The average IGE for earnings is much lower for women than men, implying that men are more likely to benefit directly (in terms of their own earnings) from the families into which they are born. This seems particularly true higher up the income distribution. For men, expected adult earnings continue to increase with family disposable income well past the 90th percentile. For women, as the chart shows, the relationship weakens further up the parental income distribution. One explanation offered by the authors is that married women may reduce their rates of employment as their spouse’s earnings increase. American individualism has always been prefaced upon the idea of equal opportunity. The new study is the latest to suggest we are long way from that idea. It also serves as a reminder that lack of social mobility is not only a problem at the bottom of the income scale.